Tempting. I have only a few of his recordings on vinyl. -- Pablo Casals was 74 years old and nearing the end of his career (his other career as conductor would last an additional 23 years). -- Gregor Piatigorsky had just signed a new, more lucrative contract with RCA. This was the opportune moment for Leonard Rose, principal cellist of the New York Philharmonic, to embark on a solo career. Leonard Rose was Columbia’s in-house cellist for the next thirty years, eventually being succeeded by his student Yo-Yo Ma. Fourteen CDs in “original jacket” format with original artwork on the front, and program notes on the back, in a CD-size cardboard box, with a 44 page booklet. Seven mono CDs + seven stereo CDs. Missing from this box are the many piano trios recorded by the Stern-Rose-Istomin Trio between 1964 and 1970. Presumably these will appear in a future box. Also missing are Rose’s 1969 recordings of two Beethoven cello sonatas with pianist Eugene Istomin. Why did Leonard Rose not record all five Beethoven cello sonatas? Basic repertoire for any cellist of his stature. Sad story: Columbia scheduled the recording sessions for 1969-70. After recording two sonatas, pianist Eugen Istomin called off the project. Not because he was dissatisfied with the musical results, but because of a contractual dispute with Columbia Masterworks. By 1970, Columbia was losing interest in documenting Istomin’s independent career as a piano soloist. “Leonard Rose was oblivious at the time and possibly never found out the truth to the simmering battle between Istomin and Columbia Records. The resulting casualty was Istomin's broken contract with Rose. 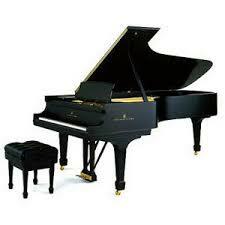 Justly or not, the pianist proceeded to stop, in its tracks, the cello and piano cycle of recordings of Beethoven. Charming, eh? Lousy and an unforgivable thing to do to a colleague, and without even telling or asking me." This was pretty much the end of the Stern-Rose-Istomin Trio. Also the end of Eugene Istomin’s career at Columbia Masterworks; until fourteen years later when Isaac Stern insisted on using him for a recording of the Beethoven violin sonatas. Beethoven Sonatas for Piano & Cello op 69 102 no 2 (CBS Masterworks) (see photos), missing from this box. The Stern-Rose-Istomin Trio gave concerts for a few more years, but made no recordings after 1970. P.S. "skulduggery" is the correct English spelling. "Skullduggery" is a Burt Reynolds movie from 1970. * Disc and tape transfers for CDs 1-4,6,9,12,14 mixing and mastering by Andreas K. Meyer and Rebekah Wineman, Meyer Media LLC, using 24-bit / 192-kHz technology. Mastering CDs 5,7,8,10,11,13 by Martin Kistner, b-sharp music & media solutions. I've got about 30 recordings of Leonard Rose on CDs, many on LP. Not only the Columbias, but RCA, Virgin Classics, and some on Pearl, West Hills Archive, Biddulph, and VAI. It is a shame Istomin didn't finish recording with Leonard Rose because of contractual thing with Columbia at the time. We are the losers, of course. I had the pleasure of hearing Leonard Rose on two or three occasions, one was a brilliant performance of the Dvorak Cello Concerto. I'm happy to see this new edition of Rose. Sony also came out with a set devoted to Eugene Istomin in December 2015 (12 CDs, 02617], which also contains his collaborations with Leonard Rose. Ah ... was so looking forward to this set. Mine arrived yesterday. The first disc, about 23 minutes in total time, consists of the Air from Villa-Lobos' Bachianas brasileiras sung by soprano Bidu Sayao, r. 1945. The balance of the disc includes tenor Christopher Lynch's Irish songs (from a 10" Columbia LP) which features not only Leonard Rose but flutist John Wummer and harpist Laura Newell. I have the original LP but it is wonderful not to hear any pops or clicks! We as collectors - are doing very well with these kinds of boxed sets, so very reasonably priced. And we are no doubt assisting Sony and other labels in buying them since other than reproducing the original jackets, the box, and booklet, costs are minimal for the companies to put them out. I recently listened to the Rose Ormandy Philadelphia recording of the Dvorak Concerto on Spotify. I don't believe I ever heard it before, even in LP days, when it was overshadowed critically by the likes of Rostropovich Karajan and Fournier Szell. I knew Rose mainly from the Beethoven trios and his Schelomo with Ormandy. I thought the Dvorak performance was tremendous, not the least because Ormandy and the orchestra made such a sensitive contribution. The sound was very good as well, although the cello was a bit bright and forward. Rose definitely deserves to be better known by collectors today. Hi TeeJay! It's nice to see you here. I see you've been a member since 2011! We hope you spend more time with us on CMG! Regarding Leonard Rose, I think he is one of the finest cellists of the 20th century who didn't make as many recordings as he might have. Fournier, Piatigorsky, Feuermann (in the early years), Rostropovich, Starker, Casals, Gendron, Janigro, Cassado, Shafran (at least in Russia along with Knuzhevitsky) still dominated the music scene more. And Rose didn't delve into Baroque-era period much with music for the cello. Still, he has a huge following, and I'm delighted Sony brought out this reissue in original jackets. [cut to] Rose definitely deserves to be better known by collectors today. My copy arrived on Friday. First up was the Brahms Double Concerto conducted by Bruno Walter. It sounded really awful, as if it was recorded in a cave. I still have a copy of the LP (ML 5076) and listened to it yesterday. While it seemed a bit lacking in highs and some orchestral details, it sounded naturally balanced and much like Walter's other Brahms recordings from that period. As it is an early pressing of this recording, its equalization characteristics may be different from those of the stereo era which began a few years later and used by modern playback equipment. Returning to the CD after listening to the LP made the former sound even more unlistenable. I turned to the Dvorak after reading TeeJay's comments. I agree it is overly bright with the brasses in climaxes sounding piercing, although for the most part the sound is very good. Ormandy's opening is the slowest I've heard--the booklet only states Allegro for the first movement tempo. 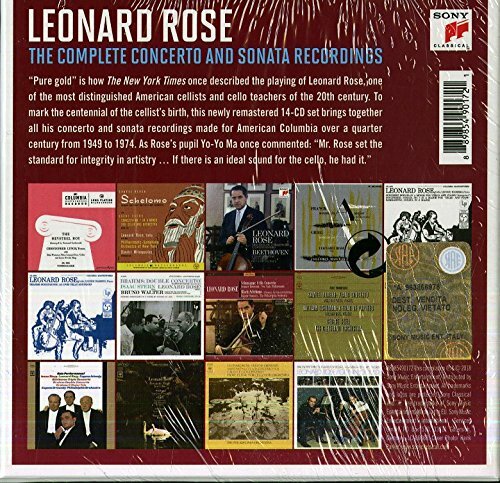 My impression of Leonard Rose is that he was a consummate professional from his beauty of sound to his exceptional technique to his dress--in every picture but one he is wearing a tie. Compare that to artists today. Got my box. Opened it, but haven't played anything yet. Waiting for the right moment. Maybe my 3rd whiskey? 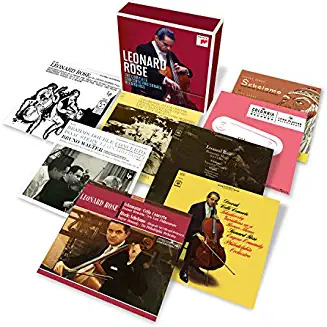 For me, there was nothing special about Leonard Rose as a soloist - many other cellists from Casals to Rostropovich and beyond whose playing is more characterful and just plain important. As principal cello of the New York Philharmonic he was fine.